We need to make the top menu (e.g. XWIKI-6548) and the content/edit menus extensible (e.g. XWIKI-5379). 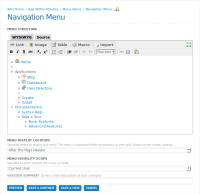 We also need an easy way to create a navigation menu similar to the one used on xwiki.org .